You may have seen my earlier post about Leeds Women’s Aid which briefly mentions that I was at an event last weekend. If you haven’t read the post, read it, share it, it’s an important one! 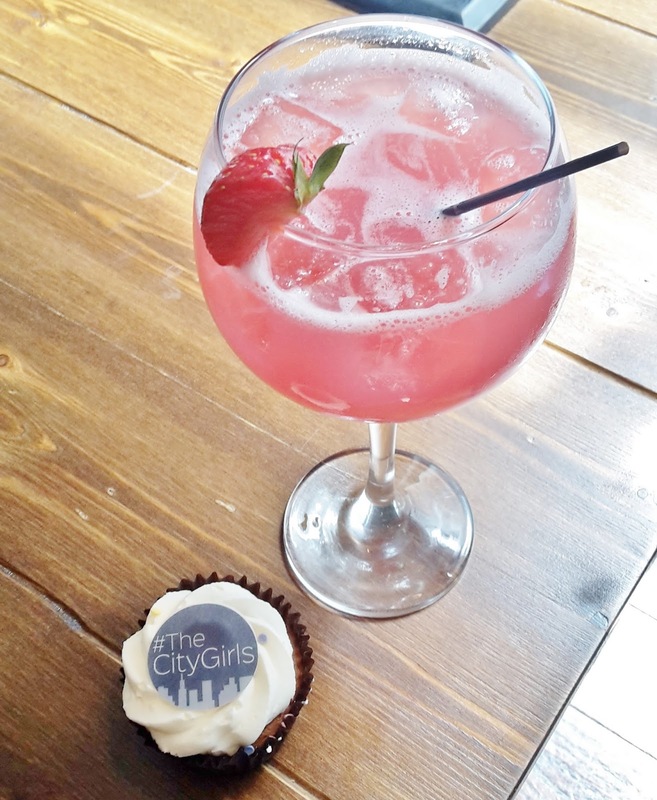 And now I’ve gotten the serious (and far more important) bit out of the way, this post is going to be all about #TheCityGirls! This event was bloody fantastic! 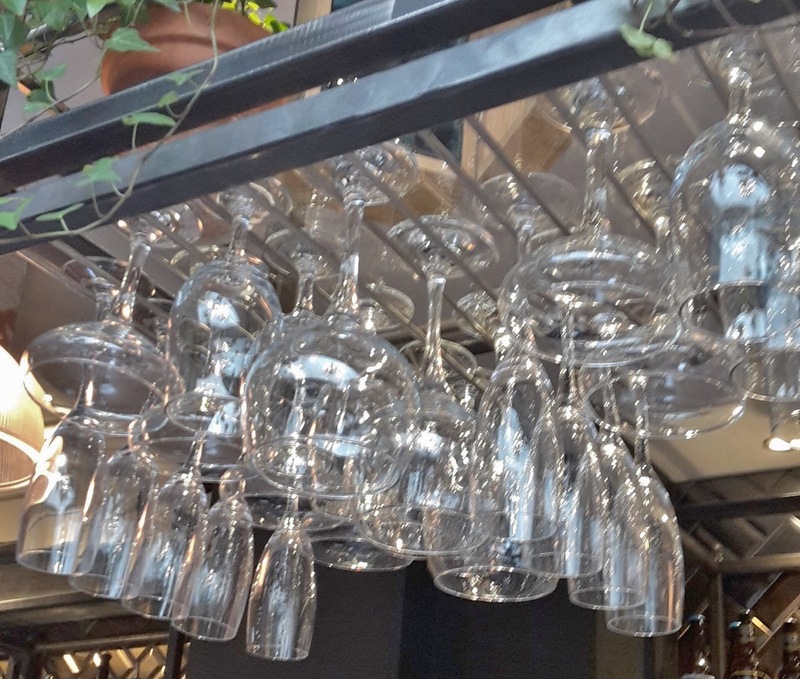 It was arranged by the lovely Holly and Lorna and needless to say, they deserve wonderwoman statuses for pulling off an event that fabulous whilst having work, blogs and their lives at the same time! They got so many brands on board to chat to us bloggers, a few of which I’ll be talking about today, and the rest will be coming up within the very near future as there’s just so much to say about them all! The event took place at The Liquorist in Leeds which is a beautiful new bar (around the corner from Beckett’s Bank) and definitely worth a visit if you’re in Leeds as it’s just so Instagram-worthy and the drinks are fabulous. We had all of the upstairs to ourselves which was lovely as everything was so on-brand with The City Girls! Lorna and Holly welcomed us all and they both gave a talk about how The City Girls came about. They basically want exciting brands to meet excited bloggers so we can shout about all that they do – needless to say, we were all pretty giddy as there were over 40 brands being represented both at the event and in the goody bags! We then had a talk from Suzie at Leeds Women’s Aid (which had the majority of us welling up) which you can read more about here. Please do click through and read it, the available support for domestic abuse sufferers is something that seriously needs shouting about! 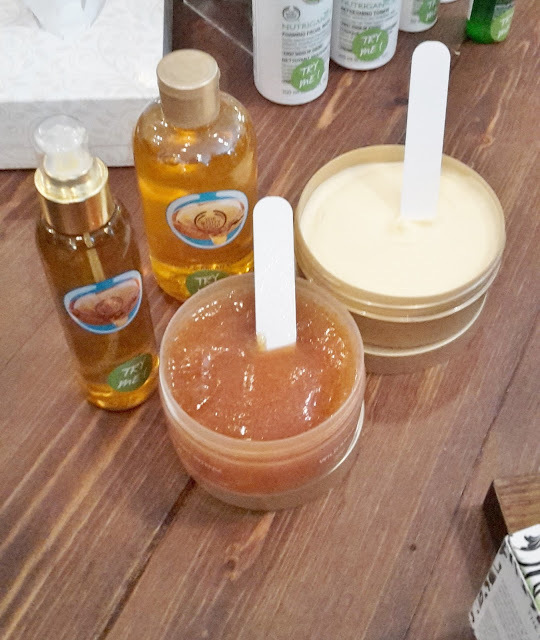 I LOVE the body shop, it’s no secret. The two girls who were there knew literally everything about the products they were chatting about. I was introduced to two of their ranges, Discover Argon Oil and Drops of Youth. The Discover Argon Oil range smells pretty much like a spa – it’s AMAZING. All of the products are up to the usual fabulous standard and I’m more than tempted to make a purchase. 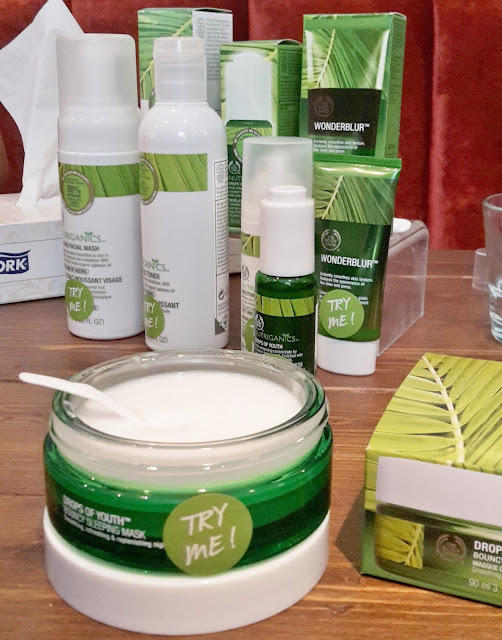 The Drops of Youth range is an interesting one as it’s an anti-ageing range but aimed at those in their mid-20s. I was really excited to hear about their sleeping mask, which you apply on top of a night cream and it seals in the goodness as it sounds like a dream – quite literally. 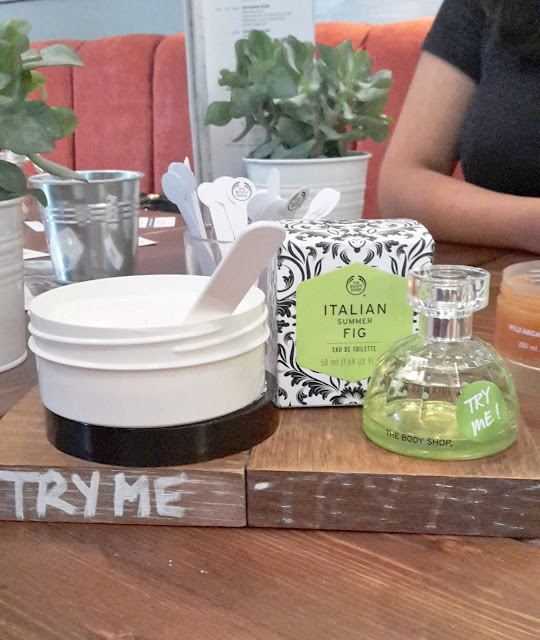 Oh and we got a sneak peak at their new Italian fig fragrance range and it smells amazing. So that was fab. 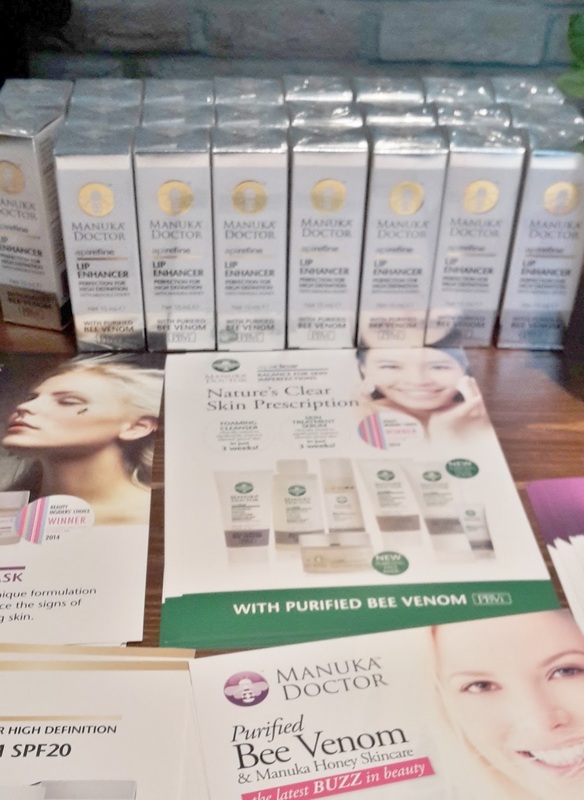 This brand is a new one to me, but they use all natural manuka honey and Bee Venom in their products. 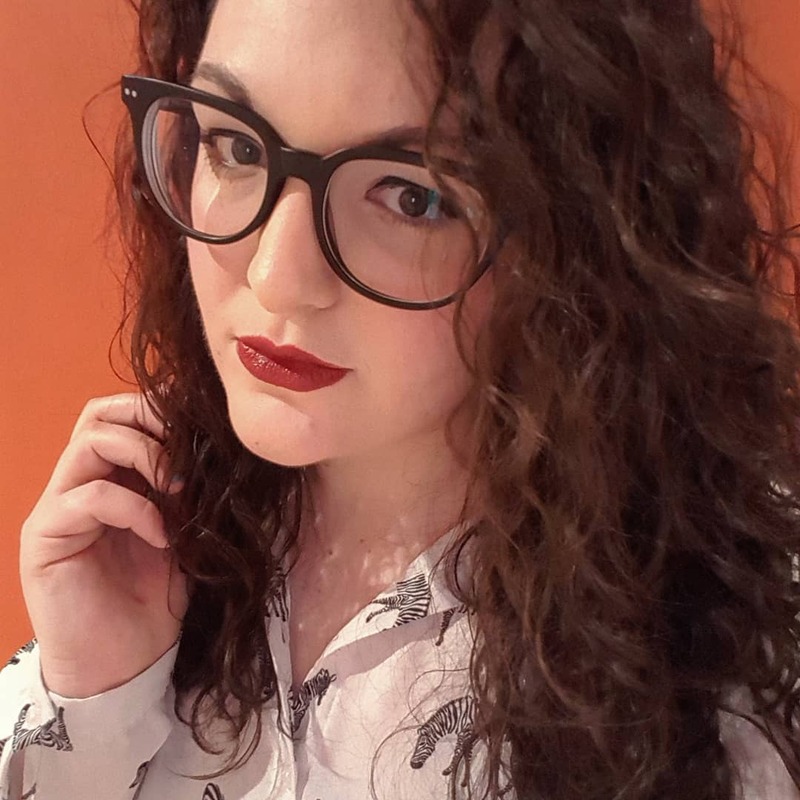 I tried out the lip gloss which was in the goodybag and it is so tingly – which you’d expect from something infused with bee venom! I did ask about the bee situation and was reassured that they’re not harmed – I was imagining a bee being pinned down and having venom extracted like a bloody donation. But that doesn’t happen. Phew. This is a women’s clothing boutique but I didn’t actually manage to get a photo of their clothes! I did fall in love with their ‘wrap me up’ jumpsuit but unfortunately like many boutique, they don’t go above a size 14. Sad times! Though if you are under a size 14, definitely get all over Kendelle online as their stuff is perfect for the races or a summer wedding. I didn’t actually get chance to meet Zack (sorry Zack) but he was there to talk about SEO and blog content – something which is so helpful for all bloggers. Until I started working at Epiphany, I was essentially winging it with my blog but now I know about SEO, it’s so much easier to write content and understand the metrics of Google. It wouldn’t be a blogger event without these babes! I tried their new They’re Real Push Up Liner in green (to match my nails, obvs) and I must admit, though I had been a bit dubious about coloured liners, I’m totally convinced now. As I have brown eyes, it really brings out the colour in a softer way than black ever could. The lovely make-up artist, Melissa, also put They’re Real mascara on my eyes in brown, which again is perfect for a more subtle day-time look. Might have mentioned this a few times (or a lot of times) but the entire day was all about raising money for Leeds Women’s Aid! From the raffle, we raised £240 which will be matched by Aviva! Read more here. 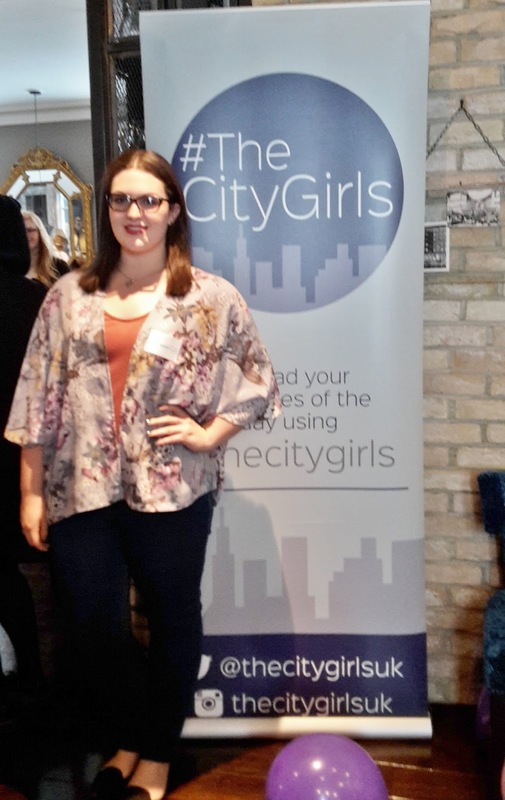 This lovely lot printed a stunning banner for The City Girls to take to their events – how nice is that?! It really made everything seem a lot more professional as it’s all so beautifully on-brand! I didn’t actually get my nails done but I so wish I had as the nail-art was AMAZING. I love beautiful nail designs and they were all so blogger-ish, it was perfect for the event! We me Eleanor from Good Relations PR and it was great to chat to her about her clients. It was also great that she gave us some branded bags that we stashed our goodies from the day in too. This kind of event really is about networking and as a PR myself, having a load of bloggers in one room is a great way to expand your blogger database! Since meeting so many new people in the last few weeks, I’m now working with a fair few on projects. So, they’re the brands that were there on the day! Keep an eye out for upcoming posts on the treats we picked up and also the treats from the goody bags.